Lock in a great price for Hotel Victoria – rated 8.9 by recent guests! Excellent view , nice and clear . People are great and kind ! Parking ok. The service was perfect. It was quite clean and warm and very welcoming. The staff/ owners of the hotel were very helpful, we were sure we had booked a family room with balcony but family rooms don't have balconies he gave us two rooms with balconies for the same price. Very helpful friendly staff, real characters ! Comfortable clean rooms with lovely bathrooms. Parking on site . Very nice pool ,very clean sadly it was raining so to cold to use .Also had a hot tub Small comfortable bar area and breakfast area , breakfast was continental , toast , croissants, jams , yogurt and local cheese and cake . Amazing views from balcony. Excellent views, friendly staff (a bit too much at times) but extremely helpful and cheerful. The hotel was clean and the breakfast pleasant and amble, tasty local honey. Quite useful that we had a fridge in our room. We had a nice rest by the pool looking at the stunning views, I think the locals are allowed to come in to use it for a fee which is nice to see that it is used well. The hotel isn't in the centre of the town but with a 6 minute walk from the centre where there a lot of tavernas and coffee shops. Great out of town location. Beautiful views. Charming staff. Excellent homely breakfast. Kindness of the owner. Very quiet location with a quit good view. The owners are very kind, helpful! They are very fair! Beautiful, clean pool. The landscape is really beautiful. Breakfast is abundant. The hotel was clean. Good parking. We will certainly return here again. Just a 10-minute walk from the center of Metsovo, this traditional hotel offers a warm, family atmosphere and stunning views of the surrounding mountains. Victoria Hotel is built in the traditional Epirotic style, with a spacious outdoor pool. Each room features wooden decoration and provides a cozy environment throughout your stay. Shower cabins with hydromassage jets and mountain views are standard. The living room and bar offers an open fire where you can relax in comfort with a warm drink. Tasty meals can be prepared upon request. The peaceful location of Hotel Victoria is ideal for exploring the wild landscape and nature of Epirus. 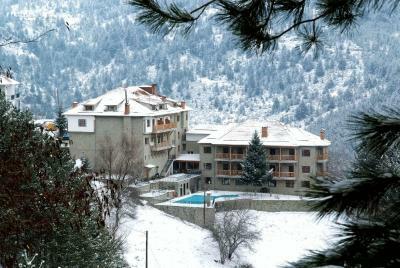 In the winter, enjoy skiing and afterwards relax in Victoria Hotel’s sauna or hot tub. During the summer, the outdoor pool is a great place to soak up the sun and admire the beautiful mountain views. Some rooms have a balcony while others have a window with views of Mount Pindos. A shower cabin with hydromassage jets is included. Τhe 2 single beds can turn into a double bed. This is a double room with an extra bed for the third guest. Some rooms have a balcony while others have a window with views of Mount Pindos. A shower cabin with hydromassage jets is included. Please note that the 3rd bed is a folding armchair. This room offers a TV and a shower cabin with hydromassage jets. Some rooms have a balcony, while others have a window with views of Mount Pindos. Some rooms have a balcony while others have a window with views of Mount Pindos. A shower cabin with hydromassage jets is offered. Free logs are included. Τhe 2 single beds can turn into a double bed. Some rooms have a balcony while others have a window with views of Mount Pindos. A fireplace and a shower cabin with hydromassage jets are included. This room features a fireplace and a shower cabin with hydromassage jets. It features mountain views from its windows. This quadruple room features a flat-screen TV. Its bathroom features a shower with hydromassage jets. No air conditioner. The room is small for 4 persons. A little bit expensive. The beds were not so comfortable. The breakfast was basic. Not right in the centre , it is walkable but weather was bad and we were tired so couldn't face the uphill climb to return . We paid 110 euros, quite expensive but probably because of the pool etc . The room felt a bit dated and although we went in the summer we still had to remove blankets and duvets from the beds. I wondered if the room was last prepared in the winter nad hadn't been used since then. The bathroom was dated but clean and functioning well. We had a room with four beds which was quite roomy. The bathroom door would not shut and swung back across the basin. Could not get the massage shower to work. No restaurant in the hotel because it was low season I think. In the only restaurant nearby we were also the only guests.